Developing a relationship with God is very much like planting a seed. Eternal Life . . . Now? 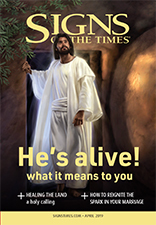 Christians commonly think that eternal life will begin at Christ's second coming. Jesus had a much different idea. From time to time, we all feel depressed, afraid, or filled with guilt. Loren Seibold explains how you can be a happy Christian. Have you ever felt as though God couldn���t accept you because you couldn���t overcome a bad habit? Even criminals aren���t hopeless cases in God���s sight. However, Chris Deigan learned that sometimes we have to hit bottom in order to look up. Have you ever felt that God simply cannot accept you because of the wrong things you've done? The Bible has a solution to that problem. Is Obedience a Condition of Salvation? For 2,000 years, Christians have debated the role that obedience plays in our salvation. The author takes another look at the issues involved in this important question. Are We Saved by Obedience? Some people feel that obedience? God can���t accept them until they���ve overcome their sins. Arnold Wheeler explains why that isn���t true. What difference does it make being a Christian, anyway? We asked five Christian authors to respond to that question. Four spiritual lessons from one of the most poignant stories in the Bible. People who feel alienated from God sometimes think their situation is hopeless. Randy Maxwell disagrees and explains how you can be—what Christians call—saved. When faced with life's greatest challenge, Sherry James learned to lean on God in ways she would never have thought possible. It's important for Christians to understand what the new birth means���and what it does not mean. How Perfect Must I Be? What does it take for God to Save you into His kingdom? Most of us humans feel apprehensive at the thought that someday we'll die, but Charles Mills explains that God has a plan for dealing with that problem. Did you ever wonder whether God accepts you just as you are���whether you're really saved? C��leste perrino Walker asked that question, and she shares God's answer. It's easy for sincere Christians to feel overwhelmed with guilt when they violate their consciences. How to change a negative self-perception. Does your soul thirst for something you just can't quite put your finger on? Evidelia G��mez may have the answer. For years Karen DeBoe struggled with an obsessive compulsive disorder. Then she turned to God for help. For 2,000 years, Christians have debated the role that obedience plays in our salvation. Here's another look at the issues involved in this important question. It's something like growing from childhood to adulthood. Does Grace Do Away With Law? It's a question that theologians have debated for centuries. Curtis Rittenour shares a biblical answer. The God she had been serving all these years was a God who demanded absolute perfection and had no tolerance for failure. What is the basis of the Christian's assurance of eternal life in God's kingdom? How does God relate to sinners who fail���who sin even though they're struggling to overcome? Will human beings be able to accept Jesus throughout eternity? Why will the opportunity end someday? Success in education and a career require long-term commitment. Reinder Bruinsma points out that the same thing is required for spiritual success. How does Jesus relate to us when we sin after we've accepted Him as our Savior? Melissa Howell gives a thoughtful response to this question. Many Christians wonder whether they're so sinful God can't accept them. The author felt that way, and she shares her answer. Our most random experiences sometimes bring us face-to-face with the issues in life that count the most. Kent Hansen says that's what happened to him. Felicito Fernando wasn't sure he could answer Yes when asked whether he was saved. The answer he found to this question may help you to answer it too. From time to time we all feel shame and guilt over the things we���ve done. The editor reflects on God���s plan for freedom from these depressing feelings. Nancy Canwell promises that this Christmas you have received a special present from Jesus Himself.